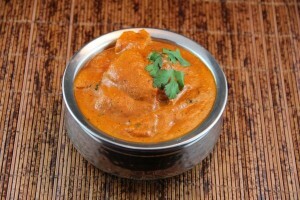 Indian style cheese cooked in a creamy tomato, pepper, onion & butter sauce. White leavened bread baked in the tandoor oven. A must for every meal. Marinated chicken served in a seasoned tomato cream sauce. 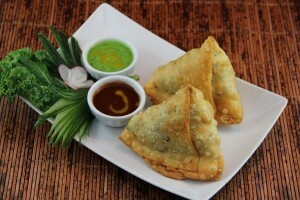 2 pcs of samosa served with tamarind chutney. Best flavored Basmati rice from India. 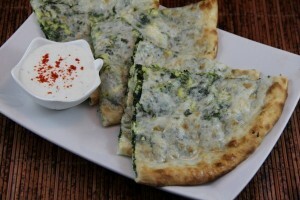 Indian style cheese cooked with fresh spinach. Orange and yellow lentil soup with spices, herbs and vegetables. Orange and yellow lentil soup with chicken. Deep fried cauliflower with sweet & sour sauce. 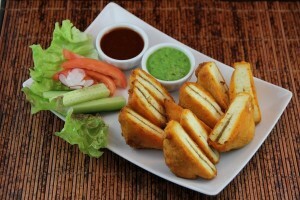 Tender pieces of Indian style cheese coated in a crispy seasoned batter. 4 pcs of flavourful potato patties seasoned with herbs & spices. Crisp flavour wafers topped with potatoes, chickpeas, yogurt with tamarind & mint chutney. 1 samosa, 2 paneer pakora, 2 aloo tikki, 2 veg pakora, tamarind & mint chutney. 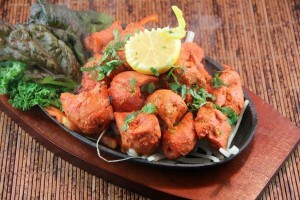 Boneless chicken marinated in yogurt, ginger, garlic & spices. Deep fried cod fish with home style potatoes vegies. 8 Prawns cooked in white wine & ginger onion tomato sauce with salad. Halibut fish baked in clayoven with ginger garlic & special herb spices served with salad. Medium size 12 pieces of prawn served with salad. New Zealand spring lamb chops baked in tandoor with salad. Tender rolls of minced lamb, onions, green peppers & spices with salad. Chicken marinated in yogurt, fresh ginger, garlic & spices with salad. Boneless chicken breast marinated in yogurt, herbs & spices, with salad. Indian style cheese marinated in yogurt, herbs & spices served w/ salad. 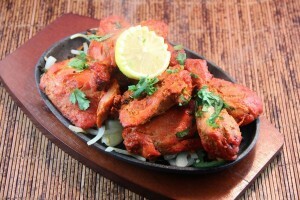 2 pcs of Tandoori chicken, 2 pcs of chicken tikka, 2 pcs of rack of lamb, 2 pcs of prawns, 2 pcs of seekh kebab comes with salad. All curries comes with Naan or Rice. Tradition curried chicken cooked in tomato & onion sauce. A spiced Goan specialty chicken cooked in a coconut curry with potatoes. Chicken cooked with bell peppers & onions in creamy tomato sauce. Chicken cooked in a creamy cashew nut sauce. A curried chicken recipe from the region Hyderabad. Chicken cooked with fresh spinach & spices. Chicken cooked with sauteed in an onion tomato sauce. Chicken cooked with sauteed onion in a tomato sauce and spices. Traditional curried lamb cooked in tomato & onion sauce. Lamb cooked with fresh spinach & spices. Lamb cooked with sauteed onion in a tomato sauce & spices. 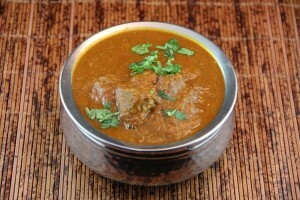 A fiery spiced Goan specialty lamb cooked in a chili sauce with potatoes. Kashmiri style lamb dish using yogurt cream & masala. Lamb served in a seasoned tomato cream sauce. Boneless lamb cooked with fried onion, tomato, cilantro & spices. Lamb cooked in a creamy cashew nut sauce. Lamb cooked in a dry fenugreek, garlic, onion, cream & spices. Prawns cooked in onion sauce & Indian spices. Prawns cooked in coconut, onion sauce & Indian Spices. Prawns cooked in creamy tomato sauce & Indian spices. Prawns cooked in a creamy cashew nut sauce. Prawns cooked with sauteed onion in a tomato sauce & spices. Prawns cooked in spinach, garlic, ginger, onion sauce & spices. Traditional curried fish cooked in a tomato & onion sauce. Cod fish with sauteed onion in a fresh tomatoes with spices. Halibut fish cooked in a tomato & onion sauce. Halibut fish cooked in a coconut, tomato & onion sauce. Halibut fish cooked with sauteed onion in a fresh tomatoes with spices. Paneer served in a seasoned tomato cream sauce. Lentils cooked in a sauce of garlic, ginger, onions & tomatoes. Indian lentils cooked in a rich & creamy sauce. 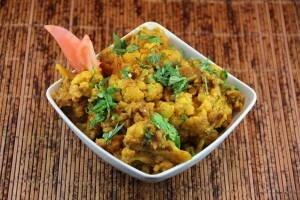 Mansoor (yellow lentils) cooked in a light onion sauce. Chicken peas cooked in a sauce of garlic, ginger, onions & tomatoes. A mix fresh seasonal vegetables cooked in Indian spices. Potatoes & cauliflower cooked with finely diced onions & tomatoes. Potatoes & green peas in an onion curry sauce. Baked eggplant cooked with onions, tomatoes & herbs. Fresh okra, onion, tomatoes, ginger, garlic & spices. Garden fresh mushrooms & green peas in a rich onion curry sauce. 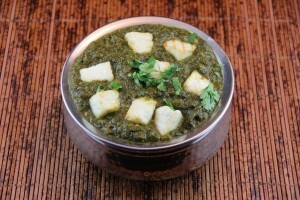 Indian style cheese cooked with green peas in an onion curry sauce. Grated Indian style cheese & peas cooked in the special cashew sauce. 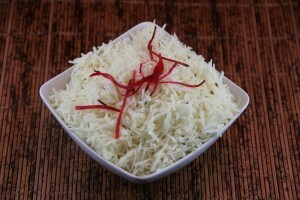 Indian style cheese cooked in green & red pepper, onion, tomatoes, ginger , garlic & spices. Indian style cheese morsels with potatoes, vegetables, raisins, cashews in a tomato sauce. Paneer cooked with sauteed onion in a tomato sauce & spices. A combination of fresh vegetables cooked with onions, tomatoes & a cashew sauce. Basmati rice cooked with apple, raisin & nuts. Basmati rice cooked with green peas & herbs. 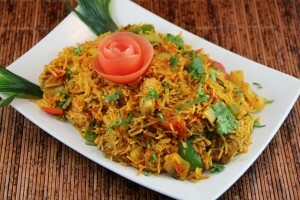 Basmati rice cooked with prawns and Indian spices. White leavened bread baked in the tandoor with touch of butter. Whole wheat bread thin baked in tandoor oven. White leavened bread stuffed with chicken. White leavened bread stuffed with dry fruit and nuts. Stuffed with spinach and cottage cheese. Yogurt, cucumber, tomato, black pepper, cumin & salt.